– Felt in a selection of colours: grey, pink, lilac, orange, green, light green, yellow, cream. 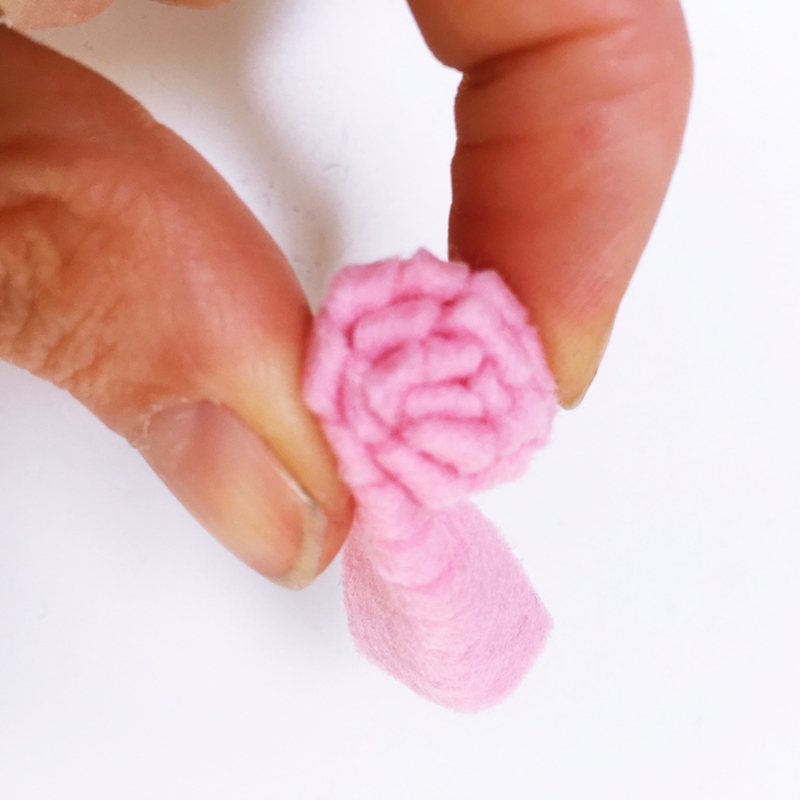 NB: if you don’t want to make felt flowers then a few artificial blooms work just as well. 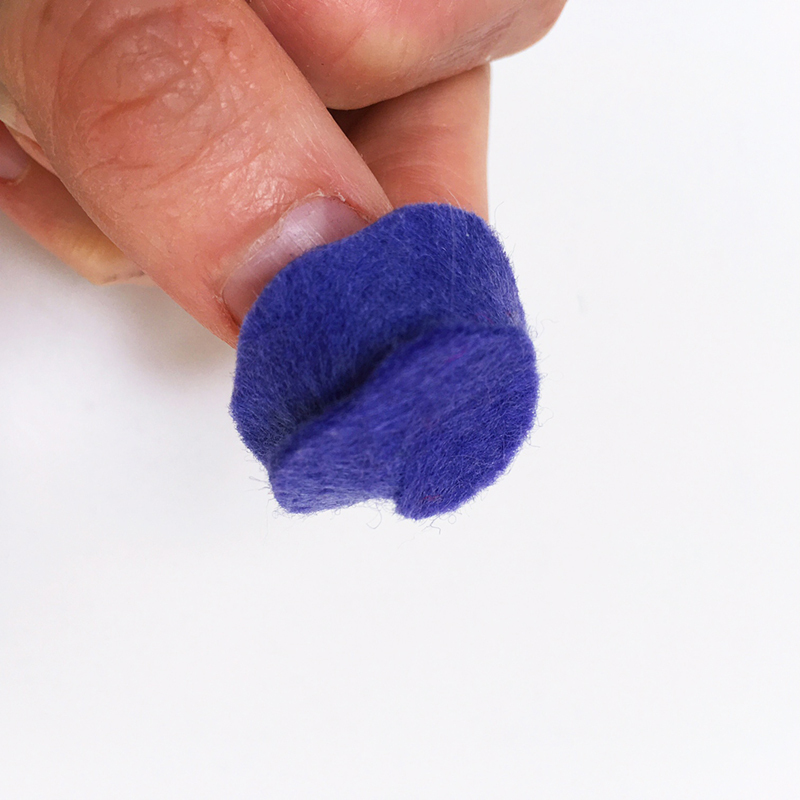 1.Take a pompom and flatten down one side – either by parting the wool or by trimming some away. 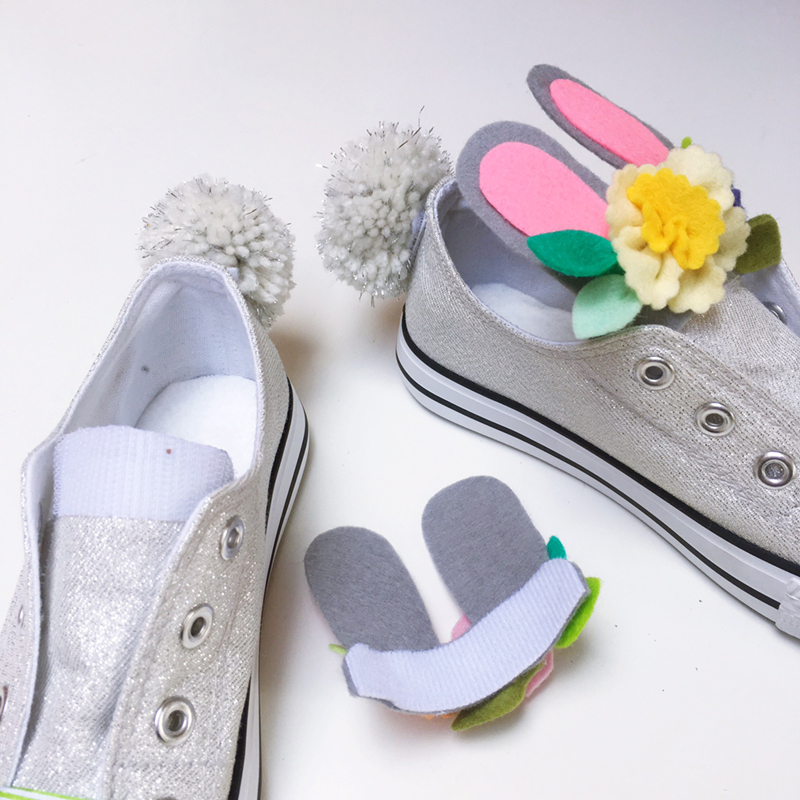 Cut a 2cm strip of VELCRO® Brand Stick On For Fabric tape and stick one piece on the pompom and the opposing half on to the back of the shoe. Repeat with the second shoe. 2. 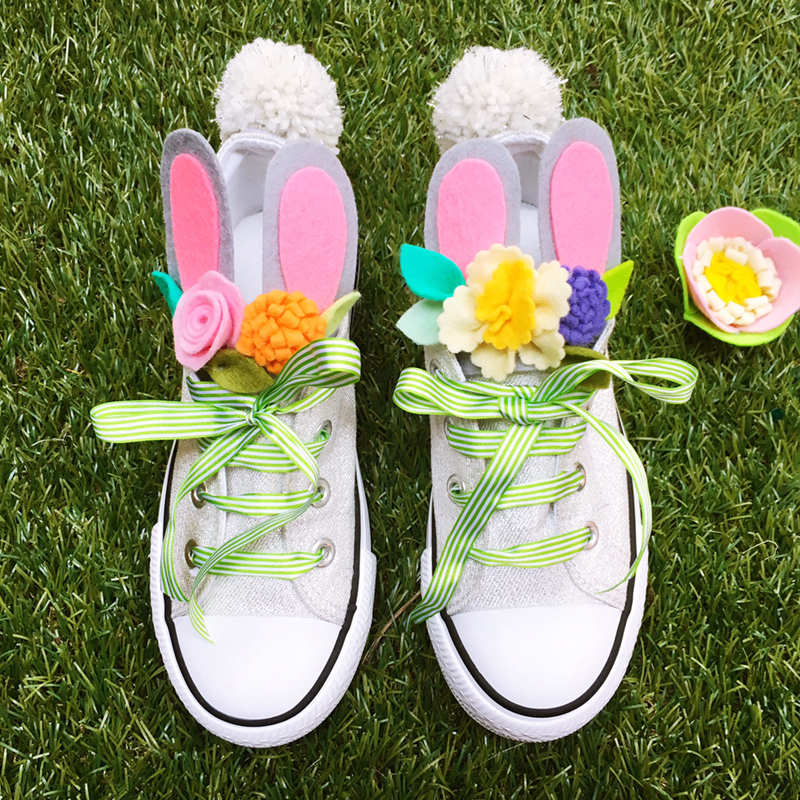 Measure the width of the tongue of one of the shoes, using the photograph above as a guide draw a set of bunny ears on to paper – make sure the width of the rectangle below the ears matches the width of the shoe tongue. When you are happy with your design cut out. To make the ears completely symmetrical fold your drawing in half vertically and then cut. 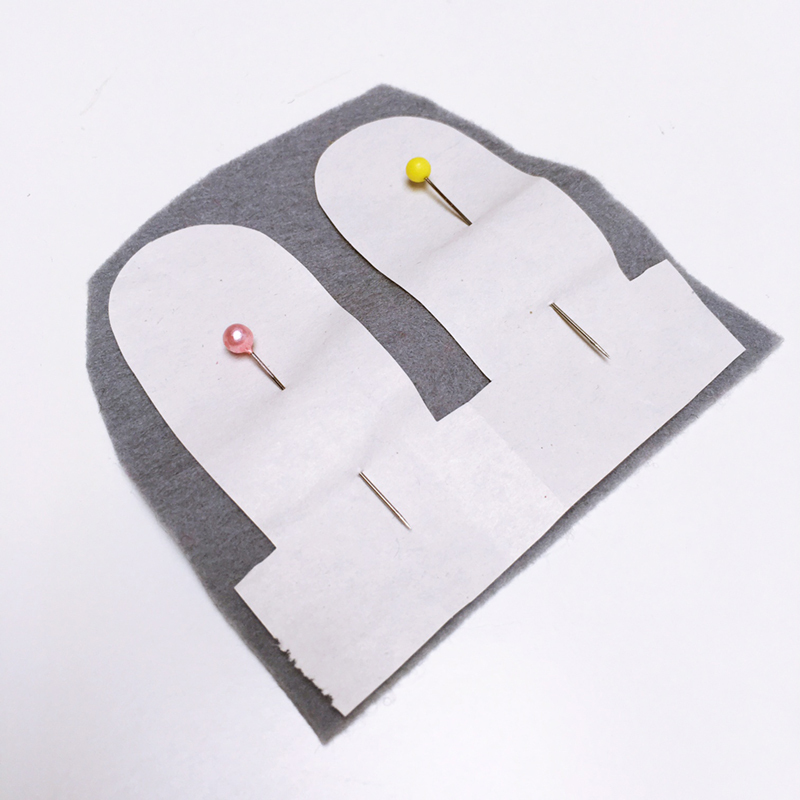 Pin the template onto the grey felt then cut out. Repeat for a second set. 3. Cut another template for the inner ear, make this a similar shape to the outer ear but slightly smaller and without the joining rectangle. 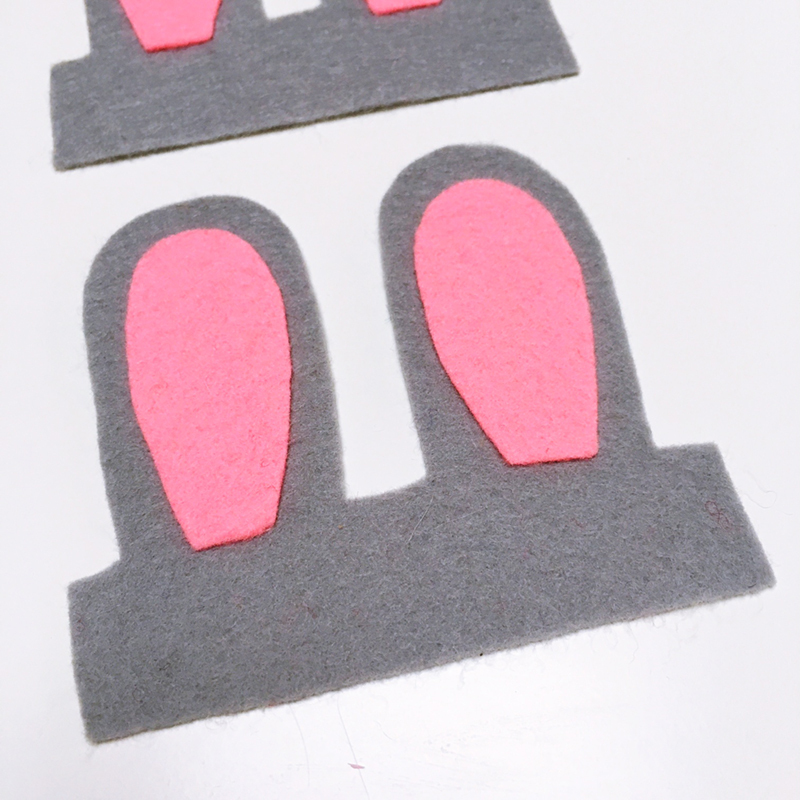 Cut four inner ears from the pink felt. 4. Glue the inner ears in place. 5. 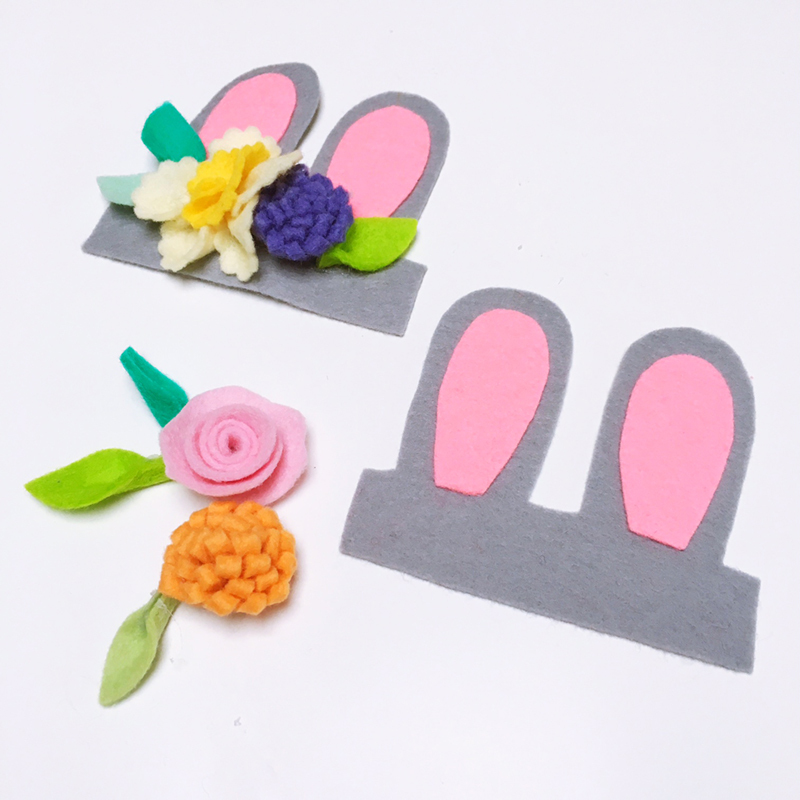 Make a selection of felt flowers and then use a glue gun or fabric glue to fix in place, you just need a couple on each set of ears. 6. Cut a 12cm x 3cm rectangle of yellow felt, concertina this into 5 sections and then cut an arch across the top. 7. 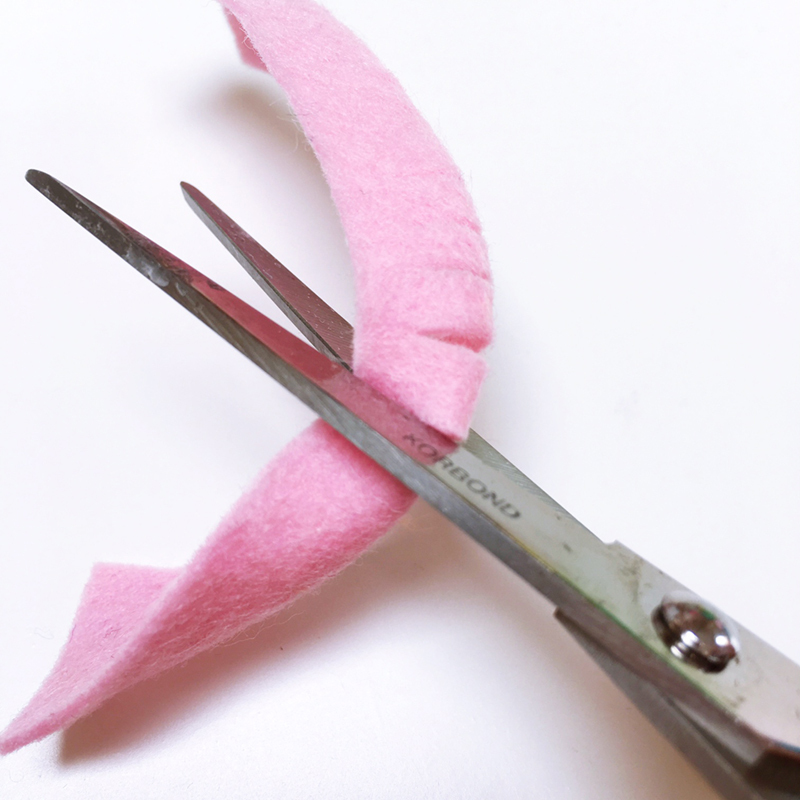 Unfold the rectangle and trim to neaten the petal shape if necessary. Cut a 7 x 2cm rectangle from the cream felt, then from this cut a freestyle wobbly shape similar to the one in the photograph. 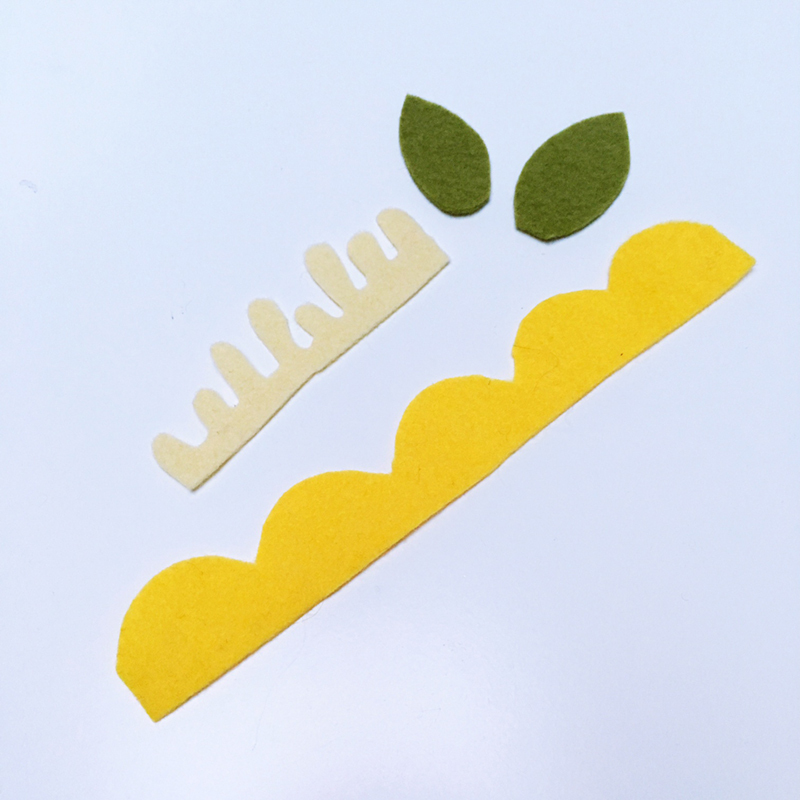 Finally cut two leaf shapes from the green felt. 9. 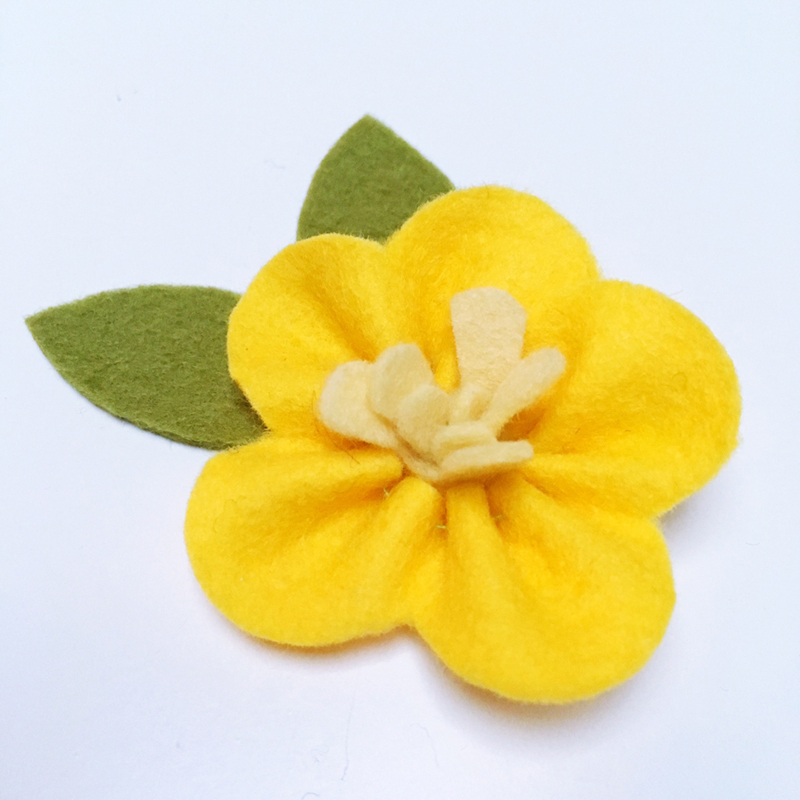 Insert the cream petals into the middle of the yellow ones and fix with a couple of stitches or a blob of glue. 10. 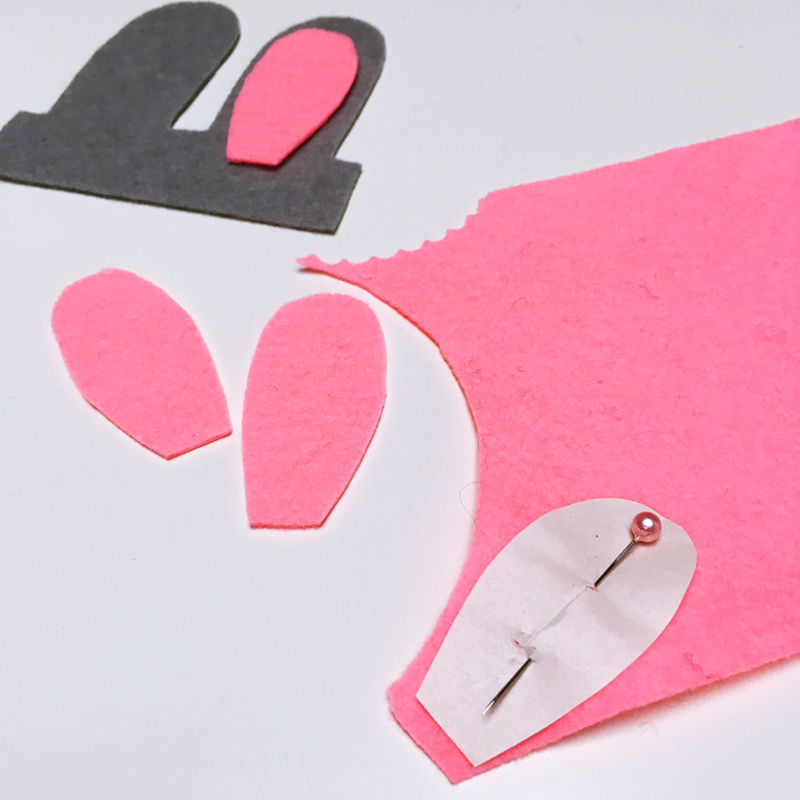 Cut a 10 x 3cm rectangle of felt, fold in half lengthways and snip into it at 5mm intervals. Make sure you don’t cut all the way through! 11. 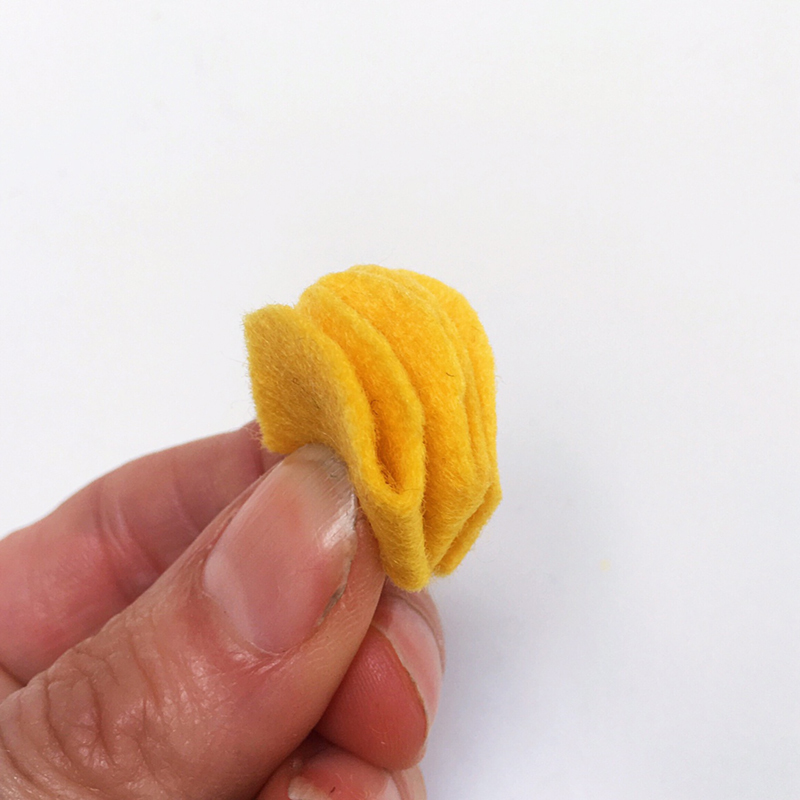 Keeping the felt folded in half and starting at one end roll into a tight bud shape. Fix at the outside edge with a small dab of glue or a couple of stitches. 12. 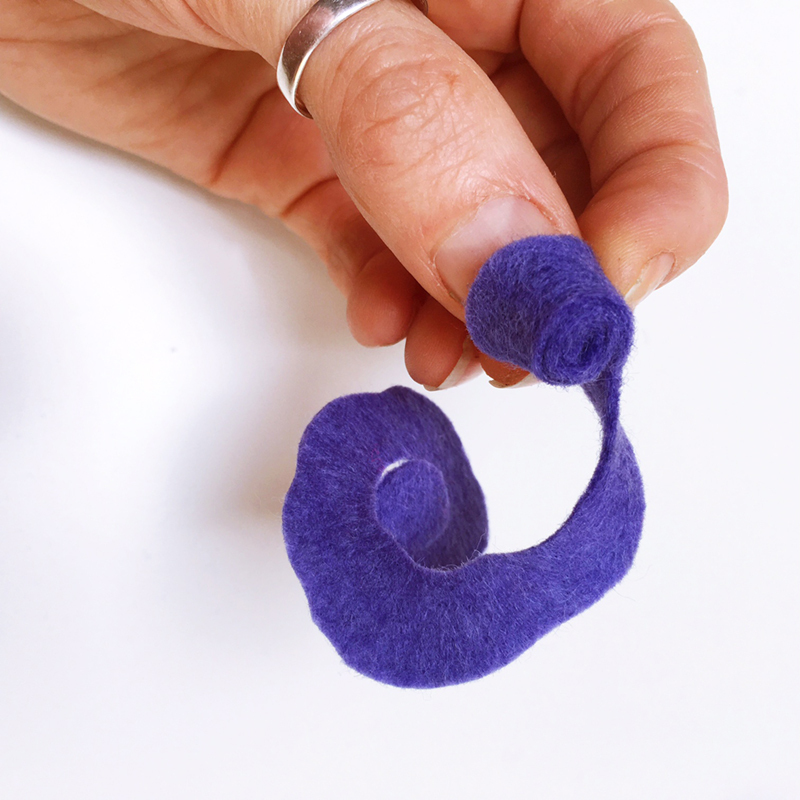 Cut a felt circle approximately 6cm in diameter. 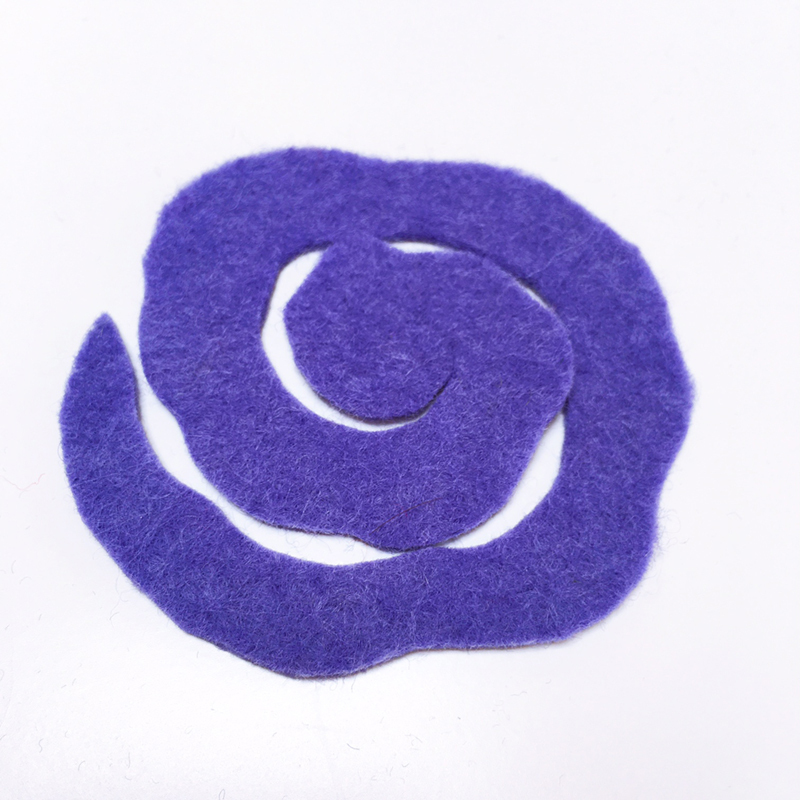 Starting at the outside cut a spiral shape into the circle, you can cut with a straight line, or a wavy one. Don’t worry about being too perfect as a wobbly line adds to the uniqueness of the final flower. 13. Starting from the outside of the circle again roll the flower up. 14. 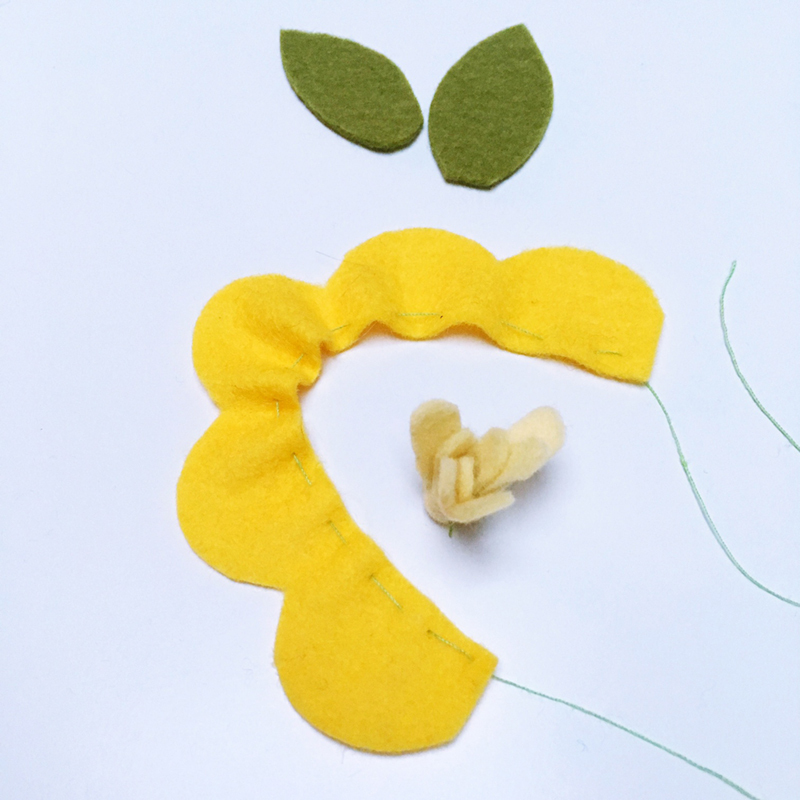 Then fix the middle of the spiral to the bottom of the flower with a blob of glue. 15. Cut a piece of VELCRO® Brand Stick On For Fabric Tape to the width of the top of the tongue of one shoe and stick in place. Take the other half and stick to the reverse of one set of ears. Repeat with the other ear. Then simply stick the two pieces together to fix the ears to the shoes. 16. Finally replace the laces with pretty ribbons.